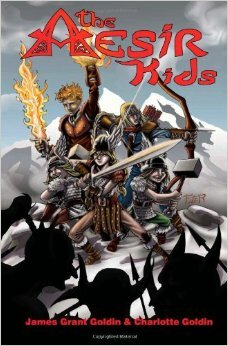 The Aesir Kids mainly follows the story of the children of Thor, Norse God of thunder. Although there isn’t a clear protagonist in the book, the most featured characters are twins Magni and Modi, a pair of very mischievous and incredibly strong 8 year-olds, and their older sister Thrud, who dreams to become a Valkyrie and serve her Grandfather Odin. The book has a strange structure, and I feel it is more like a little novel and a longer one. On the novella, Modi and Magni get tricked by their Uncle Loki, in a very Lion King style, to steal a treasure from Grymnir, the biggest and scariest giant in Jotunheim, the land of giants. By doing this, Loki is trying to start a war between the giants and the gods, in order for him to vanquish Odin, his father, and rule Asgard, the land of the gods. In the end, the kids end up righting the wrong and preventing the impending war between the worlds. The novel also features the children of Thor, but it also introduces us to Fire, the son of the Norn, which are the Norse’s equivalent to the Greek Fates. Fire is born from his three mothers, who weave the past. present and future of all the inhabitants of the 9 realms. He is then sent to Asgard to learn from the Gods and serve Odin. This time we also get introduced to more children, the sons of Loki, and also Hela, Loki’s very strange daughter that looks like a doll straight out of Monster High. Loki, set again in ruling Asgard and vanquishing the Gods, plots again to create a war between the worlds. He almost wins, by sending all the Gods to a tenth realm, but the children of the Aesir come to their parents’ aid and save the day. The Children of the Aesir is full of adventure, magic and a page-turner. It is fast paced and a fun way to become acquainted with Nordic mythology. It can become a challenge at times to keep track of all the characters, though. 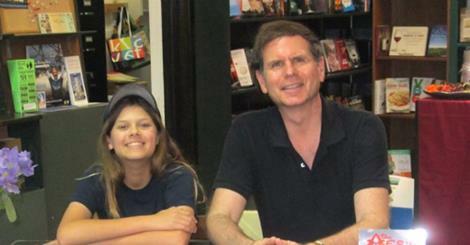 Written by a Daughter-Father team, the Aesir Kids feels very young and lively. Sometimes it is like seeing the Gods like a Nick Jr. cartoon, which I’m sure would be an awesome idea to put together. If you have kids between the ages of 8 and 12 who love adventure, fantasy and are fascinated by mythology, “The Aesir Kids” is a perfect fit. My oldest will be lost in this book! I need too pick it up for him! My youngest daughter is reading The Horse Adventure Series by Liana Melissa Allen and Donkey’s Kite is the most recent one of this series. It’s fun to find a fantasy read for a 5 yo so if anyone is looking for something for the little girls this is a great fun read! Thanks for the recommendation, Brandie! I will definitely check those out, as I’m not familiar with the series! Hope you enjoy Aesir Kids! Let me know how your oldest likes it. And your should also check out some of the other titles I’ve reviewed in the site for both kids!